Keeping your closet in vogue doesn't have to cost you -- or the earth -- a thing. Fashion-forward friends since pre-school, Sari Azout and Sari Bibliowicz share more than just a first name: they also agree upon the progressive sensibility that everything old can be new again, and even better the second time around. That's why they founded Bib+Tuck, a "community bringing together the hippest people" to trade fashion items, from this year's unworn Prada to last century's retro-chic Pucci. The invitation-only marketplace vets the online profiles of its would-be participants, keeping an eye toward style and creativity. Giving their "bibbers" (givers) and "tuckers" (takers) an artful place where they can express themselves and snap up finds by bartering their own threads, former roommates Sari and Sari have taken their age-old, friendly habit of trading clothes and turned it into an eco-friendly, points-based system that style mavens everywhere can take part in. One of the sweetest things about this fashionista-filled space is the fact that, even while its members may not exactly be strapped for cash, the money diverted from clothing and accessory expenditures can instead be funneled toward something impactful -- say, a local non-profit organization or global cause. 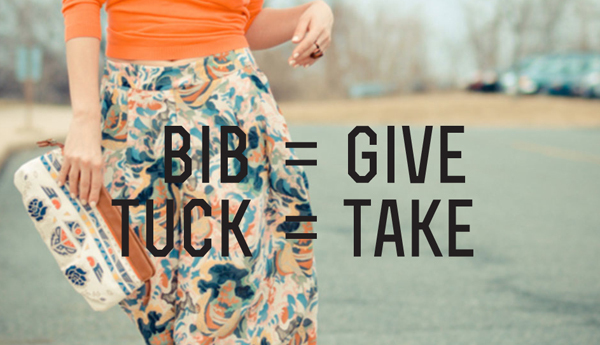 Since few things are truly more beautiful than a giving spirit, Bib+Tuck nails the nature of real community... and real beauty, too, in the process. An eco-friendly way to keep our closets full of fresh finds and keep our purses plush with funds to spend on our charities of choice? Can't think of anything more fashionable than that. Request an invitation to Bib+Tuck here.